The reservoir pond at Franklin Canyon Park. Just one of many great places to enjoy the mountains near Laurel Canyon. 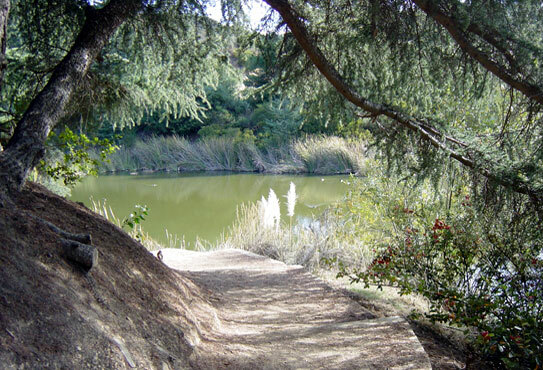 There is an adundance of recreational hiking opportunities in and near Laurel Canyon. After all, Laurel Canyon is situated in one of the largest natural areas in the county, the Santa Monica Mountains Conservancy. 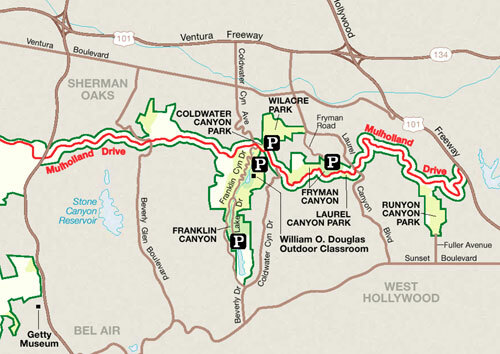 Within five minutes of any house in the canyon are six parks: Runyon Canyon Park, Fryman Canyon (with the Fryman Canyon Overlook), Coldwater Canyon Park, Wilacre Park (where the Tree People organization is headquartered), Franklin Canyon Park (that includes the Willam O. Douglas Outdoor Classroom), and Laurel Canyon Park. All of these parks offer great hiking and jogging opportunities. Fido has it especially good here as all of these parks allow dogs. Some offer picnic facilities. Unfortunately, there is no local multi-purpose, kid-safe park in our area suitable for games and family play. The nearest of these are either in the Valley or in Hollywood and West Hollywood. On this count, we should be aware that Los Angeles ranks near the bottom of US cities in terms of access per capita of multi-purpose parks. All parks in Los Angeles are currently over used, and playing fields are especially short in number. Sadly, for the thousands of kids who grow up in our hillside communities, there is no safe place to toss a ball or learn how to ride a bike. For that parents must burn gas and fight traffic for twenty minutes to get to the nearest and crowded multi-purpose park. Even Wonderland School with an enrollment of over 400 students does not have a playing field. Only two small paved yards. A map showing nearby recreational opportunities for the public.